Doug Rachlin takes questions at the 9th annual Finance Career Forum. 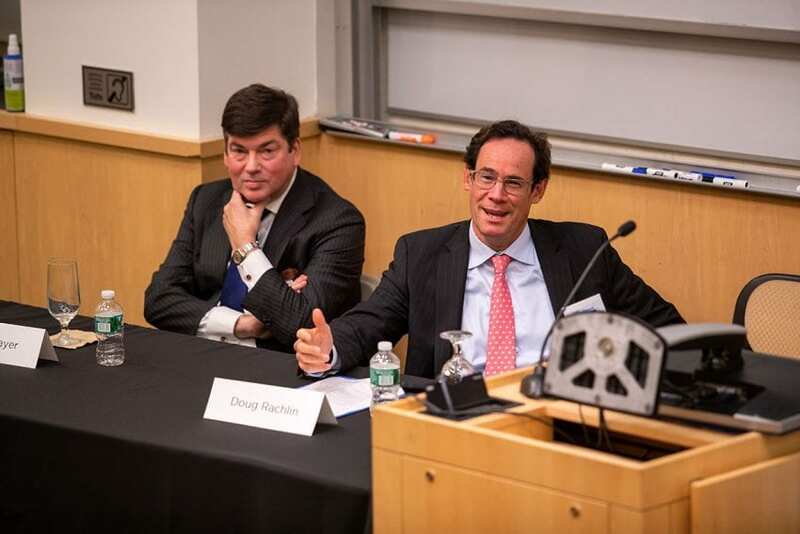 On a snowy Tuesday night in January 2013, Doug Rachlin, A85, A20P, A22P, a managing director at Neuberger Berman, walked across Tufts’ campus feeling galvanized. He had just come from a Tufts Financial Group (TFG) meeting, where he had given a presentation on investing in MLPs. The questions thrown at him by the student audience were top-notch, and the energy and enthusiasm in the room were palpable. Doug was hooked; he wanted more. Doug is a natural teacher and mentor, and a strong believer in lifelong learning. At Neuberger Berman, he assigns his summer interns case studies on everything from ethics to investment strategy and brings his entire team of seven together to review them. After one session, Tufts intern Xiling Chen, A18, reminded Doug about the teaching opportunity available through Tufts’ Experimental College. She thought he would make a great professor, and with that, Investing, Psychology, and Human Behavior was born. Doug Rachlin is a graduate of the Class of 1985, as well as a Tufts parent. He is the senior portfolio manager and founder of the Rachlin Group within Neuberger Berman’s Private Asset Management group. The Rachlin Group manages more than $4 billion in assets and has been investing in MLPs and energy infrastructure since the mid-1990s. Doug is also a member of the Tufts University Board of Trustees, President’s Council, A&S Campaign Committee, and the TFN Advisory Committee. He has been teaching in the Experimental College since the fall of 2017.